When I typed in the title of this post, I had to laugh thinking that it would be a great name for a rock band. I can imagine calling my friends, “Hey, the Fermenting Jalapenos are in town, wanna go hear them”? Yes, I’m weird in case you haven’t already noticed. Enough digression. 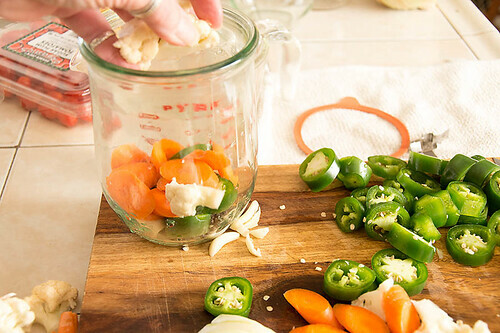 If you haven’t already fermented some jalapenos read on, you just might want to try it sometime. 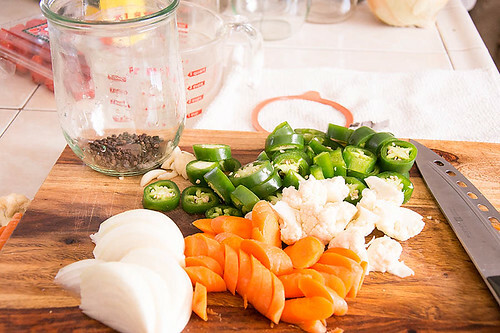 Add the jalapenos, vegetables and spices to a clean quart jar. 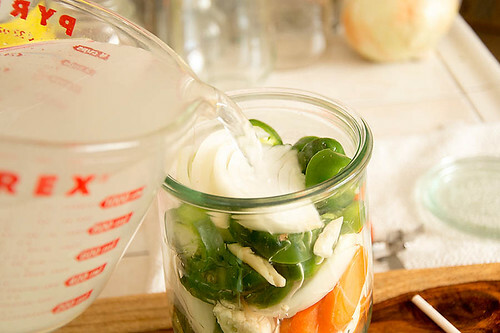 In order to keep the vegetables under the brine, you need to put something on top to keep them submerged. Top them with the leaves, and little glass bowl. 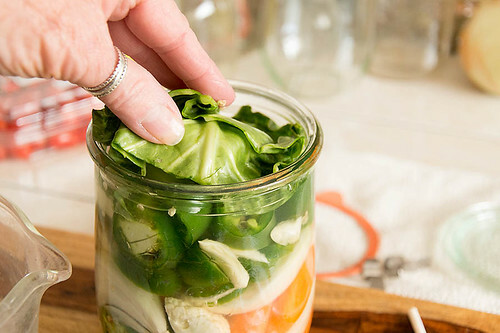 Using a chopstick, or a table knife, run it down and around the inside of the jar to release any trapped air bubbles. 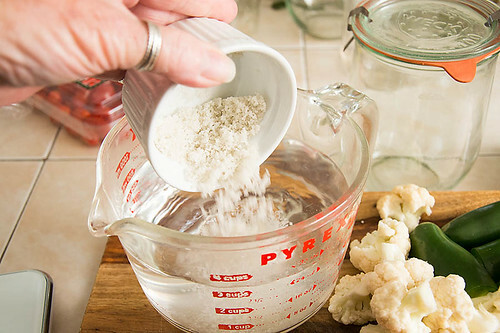 How you keep your vegetable under the brine depends on what you have on hand. 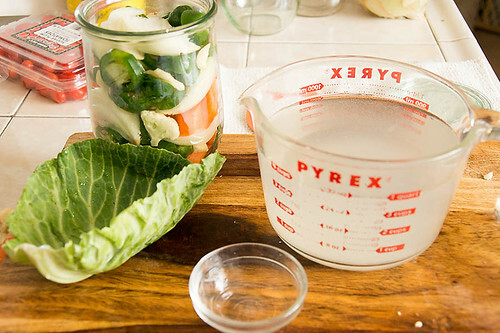 I use a few cabbage leaves, and I top the cabbage with the little glass bowl. 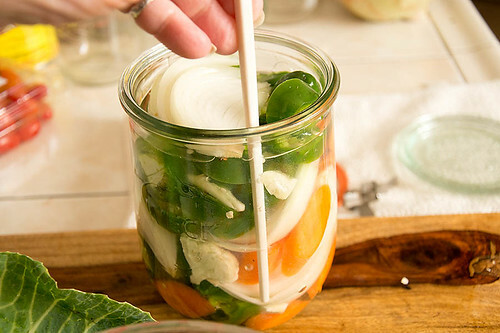 When you put the lid on the jar, it will put pressure on the little bowl and keep everything submerged. Don't forget to put the date on the jar and put in a dark cool cupboard. 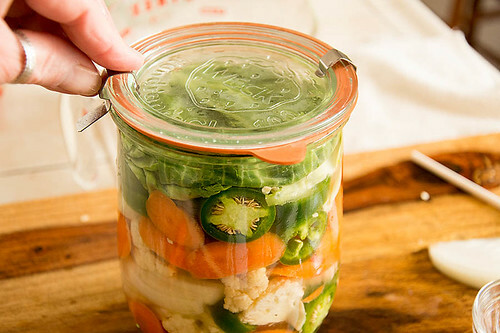 Be sure and place the jar in a bowl or on a plate, the fermentation process develops bubbles and sometimes overflowing. 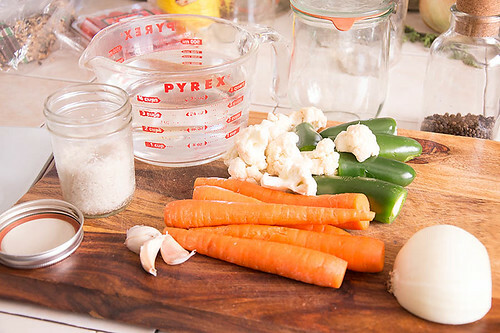 Check to make sure there is still enough brine to cover the vegetables, if not, mix and add more. After about 4 days I start tasting to see if they are to my liking. In order to not contaminate the ferment, I use chopsticks to fish out the vegetables for tasting. Eat some after three to four days, then three days later, and again a few days after that. 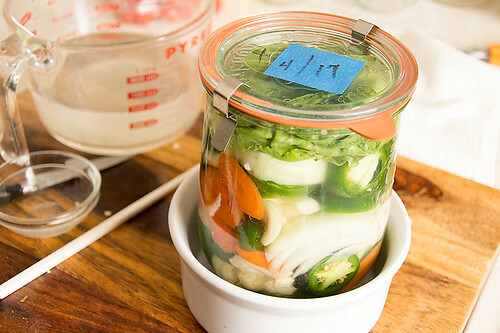 You will soon realize the range of flavors that fermentation can create and see what you like. Once they reach your desired flavor, refrigerate. 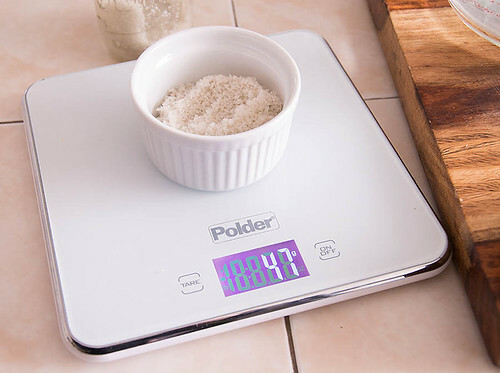 Here's a link to the expert on fermentation blog.